Miso soup is a staple on many Asian menus. It’s a simple soup made from miso paste (which has a soybean base) and a fish stock called dashi, and contains seaweed or kelp and tofu. Some fancy variations of miso soup include other ingredients like mushrooms, scallions or shrimp, but I like mine traditional! If you had the chance to read the very first post on Soup-ful, Clam Chowder with Dad, you already know my love of clam chowder goes back a generation. So, I am always on the lookout for the best bowl of clam chowder. I try it at every seafood restaurant I come across, and if it’s a seafood restaurant by the water? All the better! 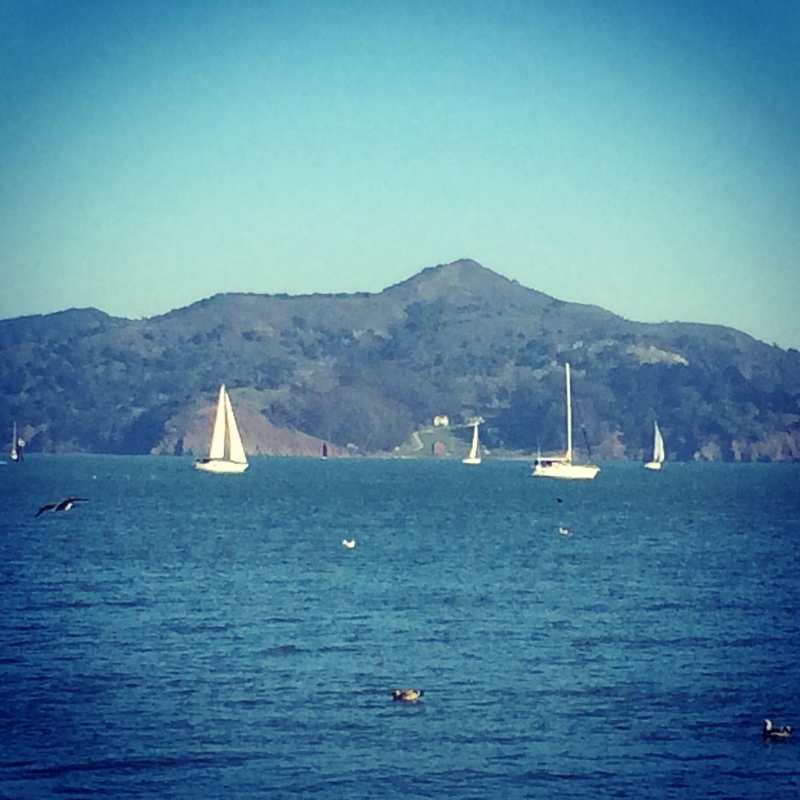 Last weekend, we took a day trip to the beautiful bayside town of Sausalito, California. Besides having a quaint downtown and gorgeous views of Angel Island and San Francisco, Sausalito has a number of great shops and restaurants. Leafy greens are a food powerhouse, there’s no doubt about it. Eating them the same way day after day (salads, sautéed spinach and kale chips are getting old) is boring, so today, I share one of my favorite ways to use greens – in soup! I thank my dear friend Molly for this delicious recipe. She said she found a variation of this in a cookbook, but I’m not sure which cookbook, so we can just give her the credit! Fresh, in-season greens are relatively inexpensive and easily accessible, and this soup is a healthy and easy way to get tons of those leafy greens into one tasty bowl. This soup can be made with a single type of green or a combination of several types, and by adding a protein you can make it even more filling. It’s great paired with a big salad, or served as a soup starter to an entrée. For this version, I started with a medium yellow onion, three garlic cloves and 1 tablespoon of ghee (you can use olive oil or coconut oil instead of ghee) and 48oz of chicken broth. Substitute vegetable broth if you prefer. 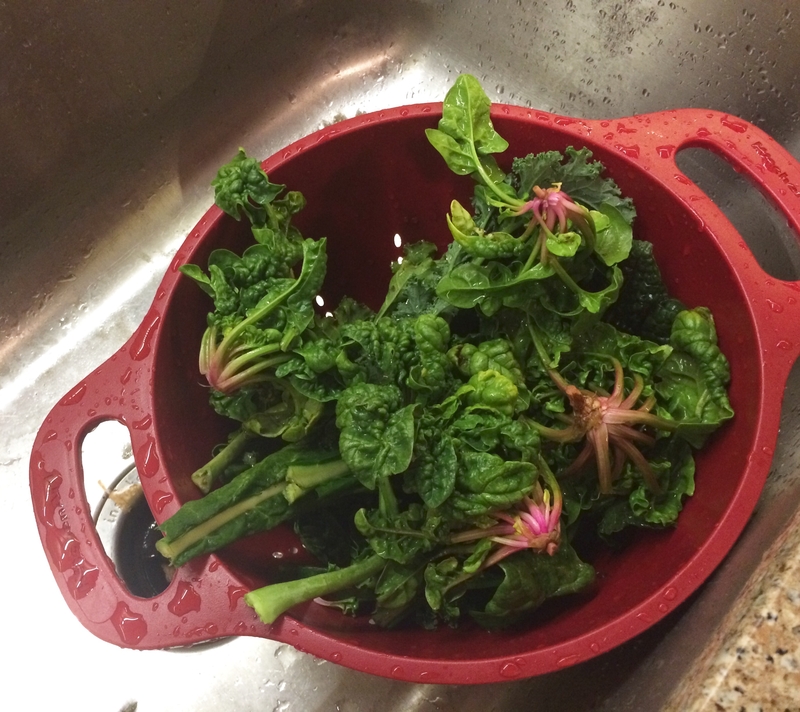 For my greens, I used a big bunch of swiss chard (washed and bottom of the stalks removed), about 6 small bunches of fresh spinach (washed and the bottom of the stalks removed) and one small bunch of kale (the stalks on the kale were short, so I just left them on). Just use whatever you have on hand. Rinse the spinach really well – no one wants gritty soup! When I was in grad school at the University of Dayton, I was a part time bartender at a great Irish pub in Dayton’s Oregon District (fun historic neighborhood if you’re ever in Dayton). The pub, the Dublin Pub, has a lot of claims to fame, but a personal favorite of mine was the green bean, ham and potato soup. After college I left my bartending days behind, but often returned to the Dub Pub for the soup I loved (and a Tullamore Dew or two…three?). So, you can imagine my disappointment when I arrived one day to hear the soup had been taken off the menu! It’s been six or seven years since then, but I still think about how good it was – simple, hearty and delicious. So, I decided to try my hand at recreating it! I found fresh green beans and a few potatoes at the farmer’s market yesterday, which sparked a memory of that soup. Add in a couple smoked ham shanks from my favorite Lower Pacific Heights grocery store, Mollie Stone’s (if you’re near one, they have great customer service and an amazing selection of fresh and prepared foods) and some herbs I already had on hand, and my recipe resurrection is on! 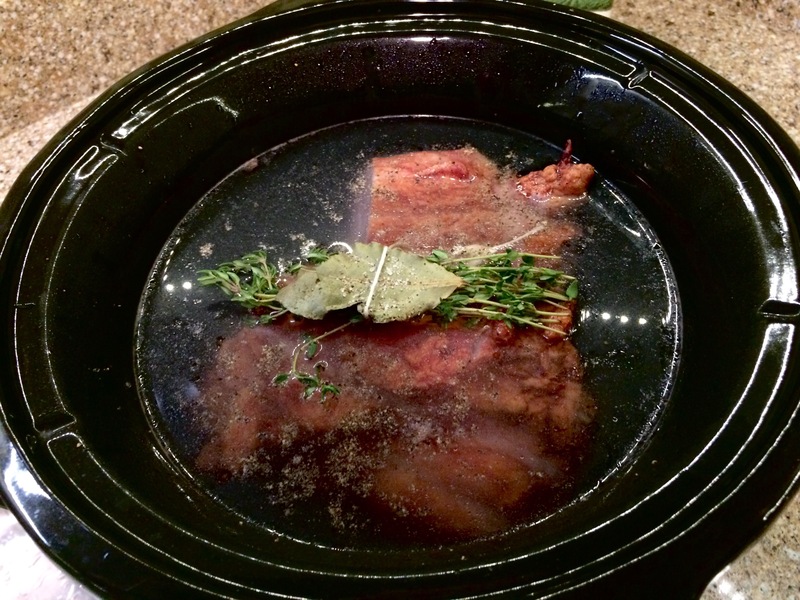 I dropped the ham shanks (a little over 2 lbs total) into a crock pot, covered them with water, added salt, black pepper, red pepper flakes and tied together two bay leaves with five thyme sprigs. Three whole cloves of garlic were added to the mix, I turned the crock pot on high and walked away. About four hours later, I turned the crock pot down to low and vented the lid. Tasting the broth at this point, I decided it was a little flavorless, so I added a vegetable bouillon cube (this would turn out to be a mistake). The meat is separating from the bones, but not quite as easily I’d like…but it’s on it’s way, so, hurray! There’s something about potato soup. Any variation of potato soup. It’s comforting, warming, indulgent and oh so delicious. When I’m in the mood for potato soup and feel little giving myself a treat (and a night away from watching caloric intake!) I usually spoil myself with a cheesy, bacon filled cream of potato soup. But this Friday, I’ve used all the vegetables from last weekend’s farmer’s markets except for one sad, lonely leek and some brussels sprouts. I’ll be restocking at the farmer’s market over the weekend (my two favorite in San Francisco are the Saturday Fillmore & O’Farrell market and the Sunday market at Divisadero and Grove and, yes, proximity to home is a factor), so I’m going to use the rest of last week’s produce by making Potato and Leek soup as the starter for our dinner of mustard and thyme chicken thighs and garlic brussels sprouts. 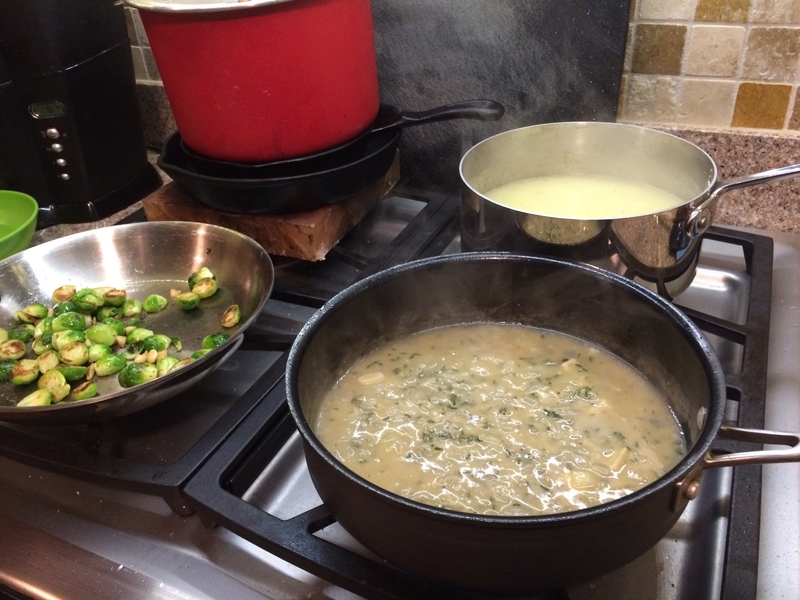 The soup reheats while the mustard and thyme sauce thickens and the brussels sprouts carmelize. Cabbage soup. It’s easy, delicious, and so good for you. Cabbage is low in calories, low in fat and high in fiber and potassium. It has Vitamin C, Vitamin K, antioxidants and it fills you up! Make a whole batch and keep it in the fridge for the next week. I usually have a bowl of the soup with a salad and a few crackers. Perfect lunch. My German relatives gave me an appreciation for cabbage as a kid. If you haven’t yet developed your appreciation for this vegetable, maybe this recipe will help! It’s hard to say what my favorite soup is. It can depend on the weather, the time of the meal, the dinner companions or the ingredients in the refrigerator. One of my favorite memories is of a family trip to New England when I was 18. My parents, sister and I got in the car in Michigan, and set off for the coast. My dad, born and raised in Massachusetts, is a die-hard fan of clam chowder (New England style, of course). In the Northwest and Midwestern United States, where my dad raised his daughters, TRUE (per Dad), clam chowder is hard to find. Therefore, that two-week trip from Michigan to Maine became a search for the best clam chowder in New England. I no longer remember where we found it, though I think it was in Boothbay Harbor, Maine (I remember this because of the very attractive college boy/lobster fisherman at the marina, though it’s possible his ruggedly handsome ways may color my memories of what happen in that town). The point is, that trip was one to remember, and the soup search made it that much more enjoyable. Still love a good bowl of clam chowder (always New England style), and it still makes me think of my dad, every time I eat one.